Fritz Kreisler (February 2, 1875 ? January 29, 1962) was an Austria-born American violinist and composer; one of the most famous violinists of his day. He is noted for his sweet tone and expressive phrasing. He produced a characteristic sound, which was immediately recognizable as his own. Although he was a violinist of the Franco-Belgian school, his tone and phrasing are nonetheless reminiscent of the gem?tlich lifestyle of pre-war Vienna. Kreisler was born in Vienna to a Jewish father and a Roman Catholic mother; he was baptised at age twelve. He studied at the Vienna conservatory and in Paris, where his teachers included L?o Delibes, Joseph Hellmesberger, Jr., Joseph Massart, and Jules Massenet. He made his United States debut at Steinway Hall in New York on November 10, 1888, and his first tour of the United States in 1888/1889 with Moriz Rosenthal, then returned to Austria and applied for a position in the Vienna Philharmonic. He was turned down by the concertmaster Arnold Rose. Hearing a recording of the Rose Quartet it is easy to hear why-Rose was sparing in his use of vibrato, and Kreisler would not have blended successfully with the orchestra's violin section. As a result, he left music to study first medicine, then painting. He spent a brief time in the army before returning to the violin in 1899, giving a concert with the Berlin Philharmonic conducted by Arthur Nikisch. It was this concert and a series of American tours from 1901 to 1903 that brought him real acclaim. In 1910, Kreisler gave the premiere of Edward Elgar's Violin Concerto, a work dedicated to him. He briefly served in the Austrian Army in World War I before being honourably discharged after he was wounded. He spent the remaining years of the war in America. He returned to Europe in 1924, living first in Berlin, then moving to France in 1938. Shortly thereafter, at the outbreak of World War II, he settled once again in the United States, becoming a naturalized citizen in 1943. He lived in that country for the rest of his life. He gave his last public concert in 1947 and broadcast performances for a few years after that. Towards the end of his life, he was in an auto accident and spent his last days blind and deaf from that accident, but he "radiated a gentleness and refinement not unlike his music," according to Archbishop Fulton Sheen who visited him frequently during that time. Kreisler and his wife were converts to Catholicism. He died in New York City in 1962. 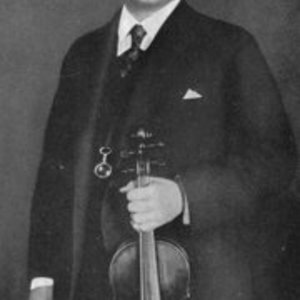 Kreisler wrote a number of pieces for the violin, including solos for encores, such as "Liebesleid" and "Liebesfreud". Some of Kreisler's compositions were pastiches in the style of other composers, originally ascribed to earlier composers such as Gaetano Pugnani, Giuseppe Tartini, and Antonio Vivaldi. When Kreisler revealed in 1935 that they were actually by him and critics complained, Kreisler answered that critics had already deemed the compositions worthy: "The name changes, the value remains" he said. He also wrote operettas including Apple Blossoms in 1919, a string quartet and cadenzas, including ones for the Brahms D major violin concerto, the Paganini D major violin concerto, and the Beethoven D major violin concerto. His cadenza for the Beethoven concerto is the one most often employed by violinists today. Kreisler's playing style is extremely personal. To modern ears, his performance persona resembles Mischa Elman with a tendency towards expansive tempi, a very luxuriant vibrato and remarkably expressive phrasing, even in superficially virtuosic passage work. Kreisler employs considerable use of portamento and rubato. However considerable performance contrasts exist between Kreisler and Mischa Elman on the shared standard repertoire with the concerto of Felix Mendelssohn serving as one example.